Hi, my name is Nino, and I’m a loot shooter addict. Give me a game that lets me shoot stuff in exchange for better weapons, and I’ll play it until the next one comes along. I stuck with Destiny before Bungie made it good, I neglected my social life when The Division 1 came out, I cocooned hard when Destiny 2 was released, and I’ve even played an embarrassing amount of the woefully disappointing Anthem. Loot shooters are the video game equivalent of pizza. I’ll take a bad one over most other dishes. It’s something about the instant gratification, the ever-present carrot on a stick, that just makes it impossible for me to put these things down. And I’m happy to report that The Division 2’s carrot is a tasty one. The Division features a modern-day, post-apocalyptic storyline, that takes place in a world ravaged by a smallpox epidemic. A virus, dubbed ‘the Dollar Flu’, was transferred through banknotes during Black Friday in 2015 and brought the United States to its knees. The player takes the role of a member of ‘The Division’, a sleeper cell of special agents who are tasked with restoring order after the catastrophe. Seven months have passed after the events of the original game and the setting has moved from a snow-covered Brooklyn to a more fair-weather version of Washington. The first game’s setting and weather combo looked cool, but it got boring fast. Thankfully, The Division 2 brings a huge improvement on this front. The amount of variety in The Division 2’s environments (and weather effects) is one of the game’s strongest points. Every mission takes you to a new (indoor) environment, and they all look gorgeous and unique. 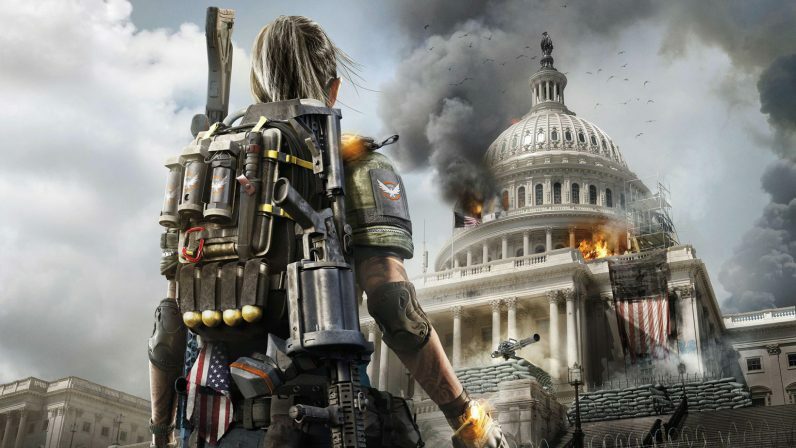 It’s not the prettiest game in the world, and the PlayStation 4 version that I played had some glaring texture issues, but The Division 2 makes up for it with a variety in content that stays interesting even after wandering around D.C. for hours and hours on end. It’s not just the environments that are more varied in the sequel, there’s also a lot more stuff to do. The open world in the original game had some stuff to collect and a bunch of roaming enemies to shoot, but not much else, The Division 2 is jam packed with little side events and other activities to keep you busy. There’s something to do on almost every street corner and the new settlements system makes those activities matter. Like in the original game, you have your base of operations where you can upgrade your agent and buy new equipment. The sequel also introduces a bunch of settlements to upgrade. These additional bases are the hubs for your operations, offering new quests and services – like a barber to change your agent’s appearance – once you’ve unlocked them. The cool thing about the settlements is that your progress is clearly noticeable. As you complete missions and settlement projects, by providing them with supplies and ticking off activities, the settlements get upgraded with new facilities and more settlers, making your actions feel impactful. It’s not the most elaborate system ever, but it’s cool to see your actions reflected in the game’s environment. It’s additions like these that make The Division 2 feel like a big step up from the initial offering. I’m of two minds when it comes to The Division 2 overall. Moment to moment, I’m really enjoying my time with it, and I can’t wait to sink way more hours into it. The shooting feels great, the excellent artificial intelligence keeps the combat interesting, the loot is good, and there’s more than enough to do. Just turn off your brain, invite a bunch of friends, and you’ll undoubtedly have a blast. There are some frustrating bugs, like the constant disappearance of your ‘skills’ (deployable drones and turrets), but the developers are aware and I’m sure it’ll be fixed by the time you read this. The other part of my brain is less excited. Post-apocalyptic Washington D.C. is the perfect setting for an intriguing political story that deals with the implications of a large-scale disaster, but it never really goes anywhere deep. Ubisoft is openly afraid to include any sort of political message in a game that’s set in the political epicenter of the western world, which results in some really awkward line-skirting. For instance, one of the very first collectables you find in the game is a recorded conversation between the US president and his Mexican counterpart. They discuss the stream of US refugees that are fleeing across the southern border, and Mexico’s unwillingness to deal with it. Even before that, the game’s intro mentions that non-gun owners were more likely to have died during the epidemic. The discrepancy between these obviously politically charged messages, and the game’s unwillingness to go anywhere with them, is jarring when you stop and think about it. The solution isn’t great, but it’s easy enough: don’t think too much when you’re playing The Division 2. The moment you start to analyze it, it falls apart, so just don’t. Treat it like you would any 80s action move, and you’ll be fine. The dichotomy becomes evident when you look at how The Division 2 is received by critics, versus its community. Reviewers are complaining about the shallow, apolitical story, while the game’s subreddit is filled with excitement. Excuse the copout, but I sympathize with both. Yes, the game could’ve done a lot more with its story, especially considering the city it takes place in, but it’s still fun as hell. There’s hours and hours of unique stuff to do, the endgame content is vast, and Ubisoft already promised a whole bunch of post-release additions. Ubisoft has been absolutely killing it when it comes to post-release support for their games, and I can’t wait to see what it’ll add to this one over the coming year. It’s not the most thought-provoking, enriching experience on the market, but it’s a perfectly enjoyable loot shooter that I’ll probably play until the next one comes along.